Having moved-in right at the start of the growing season, I wasn't able to plan my first garden the way I would have liked. Some tomatoes here, peppers there, lettuce over there... It just kind of grew organically (pun only slightly intended). The end result is ultimately that things won't be timed very well and who knows what we'll get out of it. The lettuce was ready first, of course, and it was all we could do to eat it as fast as we could and share some with friends and family. Since then, it's been a waiting game. We have the biggest squash and cucumber plants you've ever seen and they just seem to grow and grow and flower and flower, but I've yet to see fruit. 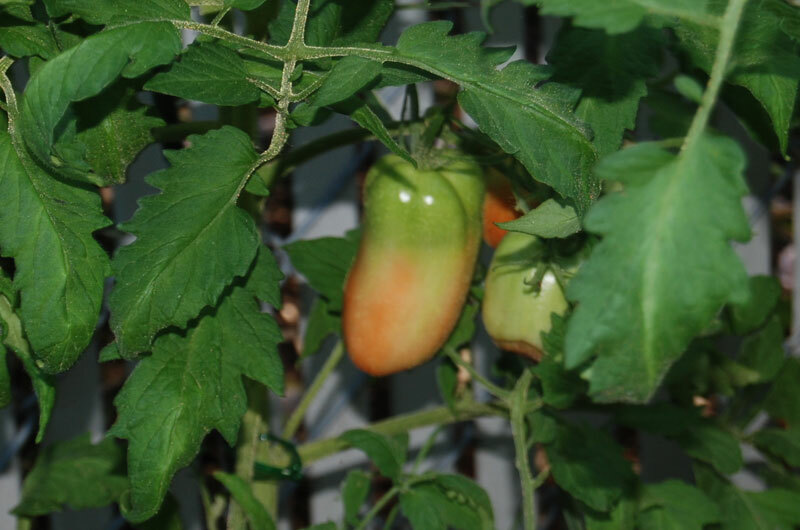 The tomatoes, on the other hand, have been fruiting a-plenty and the other day, I finally saw the first signs of some of them turning red. The one in front is a going to be a beauty. Perfectly shaped and sized. These are San Marzano's, a prized canning variety that I'm thrilled to have. The one to the right of it is also turning but has a bit of blossom-end rot that I mentioned in an earlier post. If the rotted spot dries-up, the good part of that particular fruit might be okay for chopping and adding to a pasta dish. We'll see. What's maturing in your garden?